That female star power we were talking about seeing in New Jersey ain't gonna happen, at least not this season but now Brooklyn who knows. The Nets have pulled out of trade talks with the Denver Nuggets for Carmelo Anthony. You just knew at some point they were gonna have to accept NO for an answer and that time came today as Carmelo never hinted anywhere near the direction of YES. Prokhorov said: "I was absolutely clear on this matter." In reference to Denver coming back to the table. 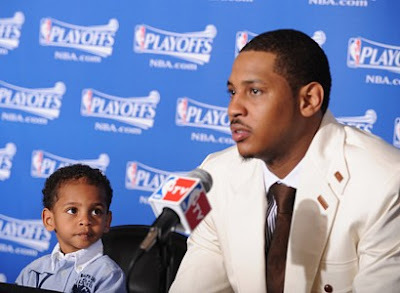 Now that it's clear Carmelo isn't going to New Jersey can Rip Hamilton have his playing time back? Geez four straight DNP-CD's for a champion and All-Star is almost, well it is unheard of.